Acute inferior myocardial infarction on an ECG. Apical left ventricular (LV) dyskinesis (ventricular aneurysm) after an anterior myocardial infarction. Coronary thrombolysis and mechanical revascularization have revolutionized the primary treatment of acute MI, largely because they allow salvage of the myocardium when implemented early after the onset of ischemia. The modest prognostic benefit of an opened infarct-related artery may be realized even when recanalization is induced only 6 hours or later after the onset of symptoms, that is, when the salvaging of substantial amounts of jeopardized ischemic myocardium is no longer likely. The opening of an infarct-related artery may improve ventricular function, collateral blood flow, and ventricular remodeling, and it may decrease infarct expansion, ventricular aneurysm formation, left ventricular (LV) dilatation, late arrhythmia associated with ventricular aneurysms, and mortality. (See the image below.) [6, 7, 8, 9, 10] Evidence suggests a benefit from the use of beta blockers, angiotensin-converting enzyme (ACE) inhibitors, angiotensin II receptor blockers (ARB), and possibly insulin infusion (with potassium and glucose) to inhibit apoptosis (cell death). 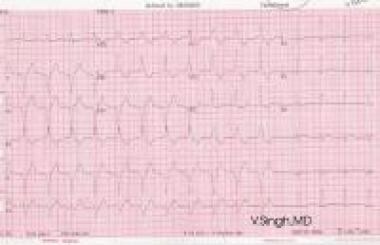 After thrombolytic therapy, reperfusion arrhythmias, such as an accelerated idioventricular rhythm (AIVR), may occur. Chest radiography is useful in determining the presence of cardiomegaly, pulmonary edema, pleural effusions, Kerley B lines, and other criteria of HF. In some patients, cephalization (evidence of vascular congestion) may be associated with peripheral pulmonary arterial pruning (decreased prominence). Chest roentgenographic findings are usually nonspecific. A small cardiac silhouette and clear lung fields in a patient with systemic hypotension may indicate relative or absolute hypovolemia. A large cardiac silhouette with similar hemodynamics may reflect hemopericardium and tamponade or right ventricular (RV) MI that is compromising cardiac output. Chest radiographic findings indicative of pulmonary venous hypertension may occur late and persist because of delay in fluid shifts among vascular, interstitial, and alveolar spaces. Multidetector-row computed tomography (CT) scanning (ie, CT scanning with 16-64 detectors) is emerging as a useful means of identifying blockages of the coronary arteries. However, it involves substantial exposure to ionizing radiation and iodinated contrast agent (more so than with cardiac catheterization). The preferred noninvasive modality for evaluating regional wall motion and overall ventricular performance is usually color-flow Doppler transthoracic echocardiography. If image quality is good and if the apex is visualized, the sensitivity and specificity of abnormal wall motion for diagnosing acute MI exceeds 90%, particularly in patients without previous MI. Assessment of segmental function and overall LV performance provides prognostic information and is essential when MI is extensive, as judged by use of enzymatic criteria, or when MI is complicated by shock or profound HF. In part, this assessment is done to identify potentially surgically correctable complications and to detect true ventricular aneurysms, false ventricular aneurysms, or thrombi. Imaging is also useful in detecting pericardial effusion, concomitant valvular or congenital heart disease, and marked depression of ventricular function that may interdict treatment in the acute phase with beta-adrenergic blockers. 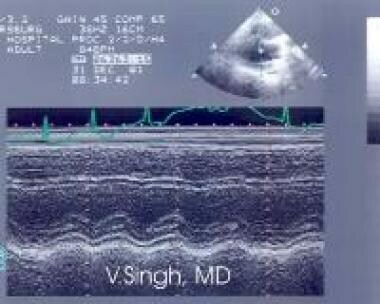 Echocardiography is also helpful in delineating recovery of stunned or hibernating myocardium. Doppler echocardiography is particularly useful in estimating the severity of mitral or tricuspid regurgitation; in detecting ventricular septal defects secondary to rupture; in assessing diastolic function; in monitoring cardiac output, as calculated from flow velocity and aortic outflow tract area estimates; and in estimating pulmonary artery systolic pressure. For dobutamine echocardiography, images are acquired during an infusion of dobutamine, which is increased from 0 to 40 mcg/kg/min in 10-mcg/kg/min increments. If target stress is not achieved (>85% of the age-predicted maximum heart rate) and if the patient does not have glaucoma, atropine may be added to augment the peak heart rate. Normal walls show a progressive increase in contractility (motion and thickening). Dead segments have poor motion and no thickening, and contractility fails to increase with high stimulation. Viable but jeopardized myocardium (ischemic myocardium) shows a biphasic response, wherein the contractility increases at lower doses of dobutamine and declines with perceptible wall-motion abnormalities at high doses of dobutamine. This kind of response is characteristic of ischemic myocardium and is most often the result of coronary stenosis. With echocardiography, endocardial dropout is common, because not all parts of the heart are seen. In 1 in 10 patients, the views are inadequate, most often because of lung disease. Positron-emission tomography (PET) scanning performed with the use of tracers of intermediary metabolism, perfusion, or oxidative metabolism permits quantitative assessment of the distribution and extent of impairment of myocardial oxidative metabolism and regional myocardial perfusion. It may also be used to assess the effectiveness of therapeutic interventions intended to salvage myocardium, and it has been used to diagnostically differentiate reversible injury from irreversible injury in hypoperfused zones. Resolution is a frequent problem. Also, a glucose load is required, and patients with diabetes need an insulin-glucose lock to ensure adequate myocardial uptake. In patients with MI, portable radiography is almost always performed in the emergency department or CCU. When present, prominent pulmonary vascular markings on the radiograph reflect an elevation in LV end-diastolic pressure (LVEDP), but clinically significant temporal discrepancies may occur because of diagnostic and posttherapeutic lags. Up to 12 hours may elapse before pulmonary edema accumulates after ventricular filling pressure becomes elevated. The posttherapeutic phase lag is even longer; up to 2 days are required for pulmonary edema to resorb and for the radiographic signs of pulmonary congestion to clear after ventricular filling pressure returns toward normal. The degree of congestion and the size of the left side of the heart on the chest radiograph are useful for identifying patients with MI who are at increased risk for dying after the acute event. Radiographic findings are nonspecific. The degree of confidence is low. If findings from transthoracic echocardiography are not diagnostic, transesophageal echocardiography may be necessary. False-positive and false-negative findings occur frequently. When CHF persists despite treatment, certain complications of MI must be excluded. These include aneurysm, pseudoaneurysm, rupture of the ventricular wall or papillary muscle, and interventricular septal defect. In converse, MI may occur as a complication of aortic dissection. An interventricular septal defect occurs in 0.5-1.0% of patients with recent septal infarction; it is characterized by cardiomegaly, pulmonary edema, and poor myocardial contractility. On the plain radiograph, the typical shunt pattern may not be appreciated because of pulmonary edema, but it may emerge months later if the patient survives. Such defects usually involve the muscular septum; they occur within 7-12 days after MI. The radiographic picture of post-MI syndrome (ie, Dressler syndrome) is that of a heart that is enlarged because of pericardial effusion. Unilateral pleural effusions are common, though bilateral effusions may also occur; lower-lobe consolidation, particularly on the left side, occurs in less than 20% of patients. These findings generally appear 2-6 weeks after MI and are analogous to postpericardiotomy syndrome. Aneurysm of the LV is an abnormal bulge or outpouching of the myocardial wall that develops in 12-15% of patients after MI. 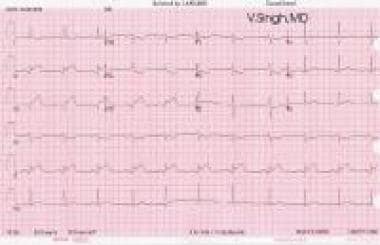 It most commonly occurs at the cardiac apex or along the anterior free wall of the LV. A true aneurysm is lined with myocardium; a false aneurysm is a contained rupture in which at least part of the wall is typically pericardium. In some cases, a false aneurysm is lined with thrombus. False aneurysm or pseudoaneurysm often has a narrow entrance to a large cavity. The chest radiograph may show a localized bulge along the ventricular wall, with or without a thin rim of calcification. CT, MRI, and echocardiography may all demonstrate differences in dyskinesis of the damaged wall. High resolution may be needed to distinguish some cases of pseudoaneurysm from true aneurysm; for this purpose, MRI is preferred. 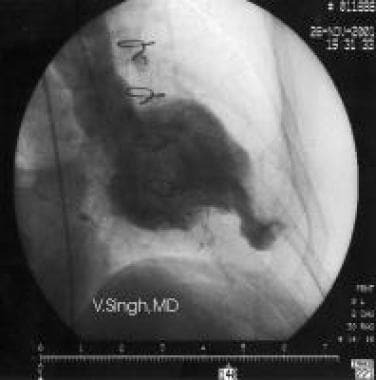 The differential diagnosis of LV aneurysm includes other deformities of the left heart border caused by pericardial cysts, mediastinal or pleural tumor, thymoma, and other mediastinal masses. Cardiac rupture usually occurs in patients who have had an acute transmural infarction. Most such patients die immediately; in a few such patients, surrounding extracardiac soft tissue contains or encloses the rupture, and a pseudoaneurysm forms. Radiographs show a paracardiac mass with sharply marginated edges free of calcification. On the lateral projection, the mass is usually posterior; by contrast, a true aneurysm appears in a relatively anterior position. Papillary muscle rupture follows MI in approximately 1% of patients. Plain radiographic findings vary from that of a normal chest to that of gross cardiomegaly with left atrial and ventricular enlargement and pulmonary edema. Left ventriculography, MRI, and Doppler echocardiography demonstrate the flail leaflets of the mitral valve and help in estimating the degree of mitral regurgitation. Complications of MI, such as pseudoaneurysm, are confirmed by means of echocardiography, MRI, or contrast-enhanced CT. Imaging of a pseudoaneurysm typically shows a relatively narrow neck and a complete absence of muscle in the wall of the pseudoaneurysm, unlike a true aneurysm, which has a rim of myocardial wall that may be identified on angiograms by the presence of mural vessels. CT angiography (CTA) may lead to an overestimation of obstructions. The degree of confidence is lower than that with MRI for assessing mural thrombi and the locations of infarcts. Although cardiac CT is less convenient than echocardiography, it is probably more sensitive than echocardiography for detecting thrombi. False-positive and false-negative findings occur frequently. MRI enables direct visualization of the myocardium with excellent delineation of the epicardial and endocardial interfaces. As a consequence, it may be used to accurately define segmental wall thinning indicative of previous MI. In some patients with a clinical history of transmural infarction, residual myocardium may be demonstrated at the site of the infarction. In other patients, MRI shows virtually complete replacement of muscle by scar. Direct visualization of the myocardium may be used to determine whether sufficient residual myocardium remains in the region jeopardized by a coronary arterial lesion to warrant bypass grafting. Image shows a scar in the anterior wall. Electrocardiogram (ECG)- and respiratory-gated MRI may demonstrate complications of MIs, such as LV thrombus and aneurysms. Transverse or short-axis tomography facilitates the recognition of the small ostium that connects the LV chamber and the false aneurysm; this is a distinguishing feature of the false LV aneurysm, as compared to the true LV aneurysm. MIs have been demonstrated on gated MRI. The region of ischemically damaged myocardium has increased signal intensity, as compared to normal myocardium. Contrast between infarcted and normal myocardium increases on images, with increased T2 contribution to signal intensity. The administration of contrast medium (gadolinium chelates) with T1-weighted spin-echo imaging increases enhancement of infarcted myocardium, with increased signal intensity, as compared to normal myocardium. Regional wall thickening may also be assessed during MRI with dynamic movies or grid-tag strain maps. A wall that is thinner than 6 mm at end diastole and wall thickening of less than 1 mm correspond to a myocardial scar, as defined by lack of uptake of technetium-99m sestamibi single-photon emission CT (SPECT) or FDG glucose on PET. Furthermore, MRI is a good predictor of recovery of regional function after myocardial revascularization. Native T1 mapping and late gadolinium enhancement have been shown to offer detailed characterization of the myocardium after acute MI. One study, by Robbers et al, found that microvascular injury after acute MI affects local T1 and T2* values, infarct zone T1 values are lower in the presence of microvascular injury, T2* mapping suggests that hemorrhage is likely in the case of low infarct T1 values, and T1 and T2* values are complementary in the correct assessment post-infarct myocardium. Gadolinium-based contrast agents have been linked to the development of nephrogenic systemic fibrosis (NSF) or nephrogenic fibrosing dermopathy (NFD). For more information, see the eMedicine topic Nephrogenic Systemic Fibrosis. The disease has occurred in patients with moderate to end-stage renal disease after being given a gadolinium-based contrast agent to enhance MRI or MRA scans. For more information, see Medscape. MRI is generally excluded for patients with pacemakers, defibrillators, and other select metallic implants. Echocardiography is inferior to MRI in image quality, especially for the apex and for the RV, but it is portable. Although MRI can precisely depict the location of infarct and the percentage of wall thickness involved, echocardiography is generally used to estimate the location on the basis of wall motion and/or wall thickening. MRI is generally superior for evaluating complications of MI, such as VSD and pseudoaneurysm. MRI may also be used to image wall motion after dobutamine or adenosine infusion to assess ischemia. Dobutamine stress MRI, using a low dose (5-15 mcg/kg/min), may be performed after a recent MI. The rationale for the use of this study is that contractile function of viable tissue improves after inotropic stimulation, whereas scarred tissue does not. Criteria for viability include end-diastolic wall thickness (EDWT) of 5.5 mm or less and dobutamine-induced systolic wall thickness (SWT) of 2 mm or more. In patients with an acute MI or recent MI, dobutamine stress MRI has a sensitivity of approximately 91% and a specificity of approximately 70%. For cardiac ischemia, dobutamine, 10 to 40 mg/kg/min, is used. However, dobutamine stress MRI has several limitations. First, ECG changes resulting from ischemia cannot be detected reliably with standard ECG monitoring in the high-field MRI environment. Instead, wall-motion abnormalities are visually and subjectively detected to ensure the patient's safety during stress testing. Also, wall thickening in response to dobutamine is not entirely specific for ischemia. The rates of false-positive and false-negative findings are low. The portability of echocardiographic equipment makes this the preferred technique for the assessment of patients with MI who are hospitalized in the CCU or the emergency department before admission. For patients with chest pain that is compatible with MI but whose ECG is not diagnostic, a distinct segment of abnormal contraction on echocardiography indicates ischemic impairment (see the image below). Hypokinesis of the anteroseptal wall observed during echocardiography in a patient presenting with an acute anteroseptal myocardial infarction. Complete 2-D echocardiographic examination typically includes color-coded assessment of blood movement (red indicates movement toward the transducer; blue, away), which reveals valvular leaks and septal defects. Continuous and pulsed Doppler likewise help in evaluating blood movement by using shifts in sound frequency to measure velocity anywhere along a column or at a specific location Because a pressure drop across a passage, such as a valve or VSD, is predominantly the result of change in kinetic energy (½ MV2), Doppler imaging may be used to estimate pressure gradients. Furthermore, equations that are based on conservation (ie, the observed fluid is neither created nor destroyed) may be used in a number of ways to estimate the severity of pressures, stenoses, and leakages. Echocardiography is also useful in evaluating patients with chest pain in whom an aortic dissection is suspected. Identification of an intimal flap that is consistent with aortic dissection is a crucial observation because it represents a major contraindication to thrombolytic therapy. Transthoracic echocardiography offers a limited view of the aorta; its usefulness is increased by including views from the suprasternal notch. 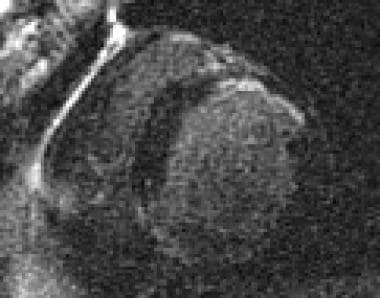 The views are improved through the use of transesophageal echocardiography, but portions of the aorta, particularly in the arch, may still be missed. CT and MRI are equally good and enable complete examination of the aorta. Areas of abnormal regional wall motion are almost universally observed in patients with MI; the degree of wall-motion abnormality may be categorized by use of a semiquantitative wall-motion score. Of note, infarcts may be missed during echocardiography when the infarction is small or when it involves just the apex. MRI is the best modality for examining the apex and small or partial-thickness infarctions. LV function, as estimated with the use of 2-D echocardiography, is well correlated with angiographic measurements; 2-D echocardiography is useful in establishing the patient's prognosis after MI. Furthermore, early use of echocardiography may aid in the detection of potentially viable but stunned myocardium (contractile reserve). Stress echocardiography is as good as nuclear imaging for detecting inducible ischemia. Radionuclide angiography, perfusion imaging, infarct-avid scintigraphy, and PET have been used to evaluate patients with MI. Nuclear cardiac-imaging techniques may be useful for detecting MI; assessing infarct size, collateral flow, and jeopardized myocardium; determining the effects of the infarct on ventricular function; and establishing the prognosis of patients with MI. However, the necessity of moving a critically ill patient from the CCU to the nuclear medicine department limits practical application of this study unless a portable gamma camera is available. For the diagnosis of MI, cardiac radionuclide imaging should be restricted to special, limited situations in which the triad of the patient's clinical history, ECG findings, and serum marker measurements is unavailable or unreliable. Radionuclides, such as thallium, sestamibi, and tetrofosmin, are used along with mechanical (treadmill or bicycle) or pharmacologic (dobutamine or adenosine) stress testing. Images are obtained at rest and during stress and are compared to look for inducible ischemia (decreased counts with stress). When thallium is used, images must be obtained within a few minutes of infusion. Images obtained at rest sometimes do not show adequate redistribution, and reinjection and imaging performed at 24 hours reveals viability that was missed during immediate imaging. Background correction is performed by acquiring images before perfusion or by estimating, using low-resolution CT or other imaging means. The degree of confidence is high. False findings are extremely rare. Additional procedures may be required to determine the hemodynamic significance of observed lesions. Microvascular disease may cause ischemia with no obstructions evident on angiography. Catheterization may cause dissection of an artery (bleeding into the vessel lining), resulting in obstruction and an MI in a patient with normal coronary arteries. Catheterization may also cause a perforation with associated bleeding into the pericardial space. Either of these events may cause death. Viability studies, such as MRI with delayed enhancement, PET, nuclear medicine studies, or dobutamine echocardiography, may be needed to determine whether damaged tissue located beyond a blockage can recover. However, the open-artery hypothesis is that opening all blocked arteries, even if the muscle they supply cannot recover function, may be best. Extensions of the catheterization technique needed for coronary angiography enable treatment to be accomplished by inserting balloons or stents and/or by locally delivering medications. These therapies are collectively known as percutaneous coronary interventions (PCIs). PCI is used instead of thrombolytic therapy to clear a blockage early in the course of an acute MI (primary angioplasty), as adjunctive therapy with thrombolysis, as a management strategy in the subacute phase of acute MI (days 2-7), or late after MI. In the early stages of MI, intervention is typically limited to the infarct-related lesion. Coronary arteriography should be performed in patients with Q-wave or non-Q-wave MI who develop spontaneous ischemia; in those who have ischemia with a minimal workload; and in those who have MI that is complicated by CHF, hemodynamic instability, cardiac arrest, mitral regurgitation, or ventricular septal rupture. Patients who experience angina or provocable ischemia after MI should also undergo coronary arteriography because revascularization may reduce the high risk of repeat infarction in these patients. No absolute contraindications are described for coronary arteriography. Risk factors for clinically significant complications after catheterization include advanced age, hemodynamic instability, multisystemic disease, large infarctions, bleeding disorders, and extensive atherosclerosis in the aorta or access arteries. Contrast-enhanced magnetic resonance angiography (MRA) is a fast-growing, noninvasive modality for vascular imaging. Current clinical applications of MRI of the coronary arteries include evaluations of anomalous coronary arteries, Kawasaki disease, and bypass-graft patency. MRI of native coronary arteries remains the most challenging area of cardiac MRI. Several factors contribute to this difficulty. The coronary arteries are small (2-4 mm in diameter) and are frequently tortuous. They have continuous inherent cardiac and respiratory motions that cause motion artifact. Both black-blood and bright-blood techniques with 2-D or 3-D linear and nonlinear acquisitions during breath holding or free breathing with navigators have been used with limited success. ECG- and respiratory-gated MRI have decreased the overall severity of these artifacts. CTA is widely used to examine the peripheral arteries and grafts. Previously, however, motion artifact hindered coronary angiography, as with MRI of the coronary arteries. Newer, faster 64-section CT angiography has substantially resolved this problem and is proving to be a convenient and useful test for confirming the absence of coronary artery disease and for constructing 3-D models of coronary obstructions and calcifications. In addition, soft plaque within arterial walls appear as areas of distinctly decreased Hounsfield attenuation. Nucifora G, Miani D, Di Chiara A, Piccoli G, Artico J, Puppato M, et al. Infarct-like acute myocarditis: relation between electrocardiographic findings and myocardial damage as assessed by cardiac magnetic resonance imaging. Clin Cardiol. 2013 Mar. 36(3):146-52. [Medline]. Ermacora D, Muraru D, Pontarollo S, Casablanca S, Livi U, Iliceto S, et al. Role of three-dimensional echocardiography in structural complications after acute myocardial infarction. Echocardiography. 2014 Jul. 31(6):E169-73. [Medline]. Abdelmoneim SS, Martinez MW, Mankad SV, Bernier M, Dhoble A, Pellikka PA, et al. Resting qualitative and quantitative myocardial contrast echocardiography to predict cardiac events in patients with acute myocardial infarction and percutaneous revascularization. Heart Vessels. 2015 Jan. 30(1):45-55. [Medline]. Cullen MW, Geske JB, Anavekar NS, Askew JW 3rd, Lewis BR, Oh JK. Handheld echocardiography during hospitalization for acute myocardial infarction. Clin Cardiol. 2017 Nov. 40 (11):993-999. [Medline]. Jansen CHP, Perera D, Wiethoff AJ, Phinikaridou A, Razavi RM, Rinaldi A, et al. Contrast-enhanced magnetic resonance imaging for the detection of ruptured coronary plaques in patients with acute myocardial infarction. PLoS One. 2017. 12 (11):e0188292. [Medline]. Rathore SS, Gersh BJ, Weinfurt KP. The role of reperfusion therapy in paced patients with acute myocardial infarction. Am Heart J. 2001 Sep. 142(3):516-9. [Medline]. Ryan TJ. Percutaneous coronary intervention in st-elevation myocardial infarction. Curr Cardiol Rep. 2001 Jul. 3(4):273-9. [Medline]. Siddiqui MA, Tandon N, Mosley L. Interventional therapy for acute myocardial infarction. J La State Med Soc. 2001 Jun. 153(6):292-9. [Medline]. Silva RC, Pellanda L, Portal V, Maciel P, Furquim A, Schaan B. Transdiciplinary approach to the follow-up of patients after myocardial infarction. Clinics. 2008 Aug. 63(4):489-96. [Medline]. Sleight P. Medical interventions in acute myocardial infarction. J Cardiovasc Pharmacol. 1990. 16 Suppl 5:S113-9. [Medline]. Fukuoka R, Horita Y, Namura M, Ikeda M, Terai H, Tama N, et al. Serial changes in glucose-loaded 18F-fluoro-2-deoxyglucose positron emission tomography, 99mTc-tetrofosmin and 123I-beta-methyl-p-iodophenyl-penta-decanoic acid myocardial single-photon emission computed tomography images in patients with anterior acute myocardial infarction. Circ J. 2013. 77(1):137-45. [Medline]. Abbott BG, Abdel-Aziz I, Nagula S. Selective use of single-photon emission computed tomography myocardial perfusion imaging in a chest pain center. Am J Cardiol. 2001 Jun 15. 87(12):1351-5. [Medline]. Achenbach S, Ropers D, Regenfus M. Contrast enhanced electron beam computed tomography to analyse thecoronary arteries in patients after acute myocardial infarction. Heart. 2000 Nov. 84(5):489-93. [Medline]. Hambye AS, Vervaet A, Dobbeleir A. Prediction of functional outcome by quantification of sestamibi and BMIPP after acute myocardial infarction. Eur J Nucl Med. 2000 Oct. 27(10):1494-500. [Medline]. Kroll D, Farah W, McKendall GR. Prognostic value of stress-gated Tc-99m sestamibi SPECT after acutemyocardial infarction. Am J Cardiol. 2001 Feb 15. 87(4):381-6. [Medline]. Mascola A, Ko J, Bakhsheshi H. Electron beam tomography comparison of culprit and non-culprit coronaryarteries in patients with acute myocardial infarction. Am J Cardiol. 2000 Jun 1. 85(11):1357-9. [Medline]. Pannu HK, Flohr TG, Corl FM. Current concepts in multi-detector row CT evaluation of the coronary arteries: principles, techniques, and anatomy. Radiographics. 2003 Oct. 23 Spec No:S111-25. [Medline]. Tanaka R, Nakamura T. Time course evaluation of myocardial perfusion after reperfusion therapyby 99mTc-tetrofosmin SPECT in patients with acute myocardial infarction. J Nucl Med. 2001 Sep. 42(9):1351-8. [Medline]. Zhang X, Liu XJ, Wu Q. Clinical outcome of patients with previous myocardial infarction and leftventricular dysfunction assessed with myocardial (99m)Tc-MIBI SPECT and(18)F-FDG PET. J Nucl Med. 2001 Aug. 42(8):1166-73. [Medline]. Knaapen P, de Mulder M, van der Zant FM, Peels HO, Twisk JW, van Rossum AC, et al. Infarct size in primary angioplasty without on-site cardiac surgical backup versus transferal to a tertiary center: a single photon emission computed tomography study. Eur J Nucl Med Mol Imaging. 2008 Aug 22. [Medline]. Saeed M, Hetts SW, Do L, Wilson MW. Assessment of microembolization associated with revascularization in acute myocardial infarction: MDCT cardiac perfusion and function study. Int J Cardiovasc Imaging. 2013 Sep 26. [Medline]. Hulten E, Goehler A, Bittencourt MS, Bamberg F, Schlett CL, Truong QA, et al. Cost and Resource Utilization Associated With Use of Computed Tomography to Evaluate Chest Pain in the Emergency Department: The Rule Out Myocardial Infarction Using Computer Assisted Tomography (ROMICAT) Study. Circ Cardiovasc Qual Outcomes. 2013 Sep 1. 6(5):514-24. [Medline]. Panayi G, Wieringa WG, Alfredsson J, Carlsson J, Karlsson JE, Persson A, et al. Computed tomography coronary angiography in patients with acute myocardial infarction and normal invasive coronary angiography. BMC Cardiovasc Disord. 2016 May 3. 16:78. [Medline]. Rajiah P, Desai MY, Kwon D, Flamm SD. MR Imaging of Myocardial Infarction. Radiographics. 2013 Sep. 33(5):1383-412. [Medline]. Hillenbrand HB, Kim RJ, Parker MA. Early assessment of myocardial salvage by contrast-enhanced magneticresonance imaging. Circulation. 2000 Oct 3. 102(14):1678-83. [Medline]. Kramer CM, Rogers WJ Jr, Pakstis DL. Absence of adverse outcomes after magnetic resonance imaging early afterstent placement for acute myocardial infarction: a preliminary study. J Cardiovasc Magn Reson. 2000. 2(4):257-61. [Medline]. Abanador-Kamper N, Kamper L, Vorpahl M, Brinkmann H, Karamani V, Haage P, et al. Clinical predictors for the manifestation of late gadolinium enhancement after acute myocardial infarction. Medicine (Baltimore). 2017 May. 96 (21):e7004. [Medline]. Robbers LFHJ, Nijveldt R, Beek AM, Teunissen PFA, Hollander MR, Biesbroek PS, et al. The influence of microvascular injury on native T1 and T2* relaxation values after acute myocardial infarction: implications for non-contrast-enhanced infarct assessment. Eur Radiol. 2018 Feb. 28 (2):824-832. [Medline]. Nensa F, Poeppel T, Tezgah E, Heusch P, Nassenstein K, Mahabadi AA, et al. Integrated FDG PET/MR Imaging for the Assessment of Myocardial Salvage in Reperfused Acute Myocardial Infarction. Radiology. 2015 Apr 3. 140564. [Medline]. Derumeaux G, Loufoua J, Pontier G. Tissue Doppler imaging differentiates transmural from nontransmural acute myocardial infarction after reperfusion therapy. Circulation. 2001 Jan 30. 103(4):589-96. [Medline]. Galasko GI, Basu S, Lahiri A. A prospective comparison of echocardiographic wall motion score index and radionuclide ejection fraction in predicting outcome following acute myocardial infarction. Heart. 2001 Sep. 86(3):271-6. Garg N, Agarwal AK. Role of echocardiography in acute myocardial infarction. J Assoc Physicians India. 2000 Jul. 48(7):719-23. [Medline]. Moller JE, Sondergaard E, Poulsen SH. The Doppler echocardiographic myocardial performance index predicts left-ventricular dilation and cardiac death after myocardial infarction. Cardiology. 2001. 95(2):105-11. [Medline]. Paventi S, Parafati MA, Di Luzio E. Safety and feasibility of two-dimensional echocardiography and myocardialperfusion imaging in patients with chest pain. Angiology. 2001 May. 52(5):305-9. [Medline]. Rocchi G, Kasprzak JD, Galema TW. Usefulness of power Doppler contrast echocardiography to identify reperfusion after acute myocardial infarction. Am J Cardiol. 2001 Feb 1. 87(3):278-82. [Medline]. Vargas-Barron J, Roldan FJ, Romero-Cardenas A. Two- and three-dimensional transesophageal echocardiographic diagnosis ofintramyocardial dissecting hematoma after myocardial infarction. J Am Soc Echocardiogr. 2001 Jun. 14(6):637-40. [Medline]. Vasey CG, Usedom JE, Woodard SM. Prediction of cardiac mortality after myocardial infarction: the role of maximal treadmill stress echocardiography. J Am Soc Echocardiogr. 2001 Jan. 14(1):38-43. [Medline]. Bjerking LH, Hansen KW, Madsen M, Jensen JS, Madsen JK, Sørensen R, et al. Use of diagnostic coronary angiography in women and men presenting with acute myocardial infarction: a matched cohort study. BMC Cardiovasc Disord. 2016 Jun 1. 16:120. [Medline]. Pollack CV Jr, Gibler WB. 2000 ACC/AHA guidelines for the management of patients with unstableangina and non-ST-segment elevation myocardial infarction: a practicalsummary for emergency physicians. Ann Emerg Med. 2001 Sep. 38(3):229-40. [Medline].